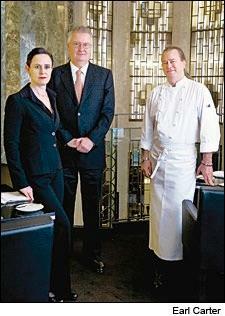 Sophie Otton, David Doyle and Chef Neil Perry at Rockpool Bar & Grill Sydney, Australia's first ever Grand Award winner. This year, Wine Spectator’s Restaurant Wine List Awards program honors seven new Grand Award winners, the program’s largest class since 1993. All have passed rigorous evaluations, demonstrating that their wine lists, service, cuisine and ambience are worthy of the program’s highest honors. Four of the winners are located in the United States: Alex Restaurant in Las Vegas, Pappas Bros. Steakhouse Houston, RN74 in San Francisco, and Spago Beverly Hills. Three come from the Far East, increasingly a source of fine restaurants with ambitious wine programs: Don Alfonso 1890 in Macao, L’Atelier de Joël Robuchon in Hong Kong and Rockpool Bar & Grill Sydney in Australia. Each restaurant is profiled in detail in Wine Spectator’s August 31, 2010 issue. Wine Director Rajat Parr focuses on Burgundy's best at RN74. The new Grand Award winners have built their wine lists principally around the classic wine regions of France and California. Verticals of Bordeaux and California Cabernets abound. Burgundy also shares the limelight; the region’s famed and food-friendly Pinot Noir and Chardonnay bottlings play a significant role in all of this year’s new Grand Award-winning wine lists. Even the steak-centric Rockpool Bar & Grill Sydney features stunning breadth and depth in the region, including 115 bottlings of Domaine de la Romanée-Conti back to a 1934 Romanée-Conti. San Francisco’s RN74 goes so far as to borrow its name from Burgundy’s famed road on the Côte d'Or. Joining the new winners are 68 restaurants—for a total of 75—that successfully renewed their Grand Awards for wine lists that, on average, offer more than 2,800 selections and feature serious breadth and depth from the best wine regions, producers and vintages. Since 1981, Wine Spectator’s Restaurant Wine List Awards has honored the world’s best wine lists. A total of 3,743 restaurants earned awards in 2010. Of them, 579 offer inexpensive prices (with many bottles under $50 and below-normal markups), and 719 are located outside the United States, in 60 different countries. Among the 2010 recipients, 788 restaurants earned the Best of Award of Excellence, the program’s middle-level award. It honors wine lists that generally offer at least 400 selections, with modest depth or superior breadth in at least one classic region. having recently dined at spago beverly hills, i was extremely impressed with the depth and breadth of their list across many countries and through many vintages. i was not impressed with their markup on their wines, but that's a different conversation for a different day. They bring it @ RN74 what a list! The Wine Spectator's awards of excellence continues to be a reliable means to finding quality dining in cities and towns where I am not familiar with the better establishments. Most recently was yesterday, when in Newport, R.I., where a cruise through the online Dining and Travel search, we found The Mooring, which provided our small group with a delicious meal and wonderful wine service.